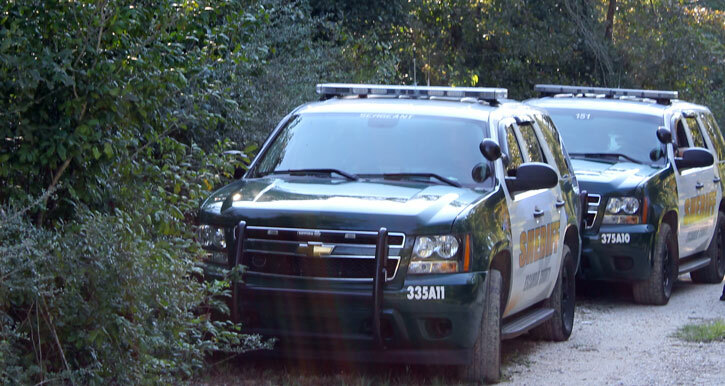 Escambia County deputies are working to determine who was responsible for tens of thousands of dollars worth of marijuana found growing behind a Molino home Thursday afternoon. The Escambia County Sheriff’s Office Air One helicopter located about 80 marijuana plants as they were flying a marijuana eradication mission. Tactical Flight Officer Sgt. Vince Odenbrett and pilot Rich Hunt were flying over the area of Highway 29 and Highway 97 when they located the plants behind a home at 7511 North Highway 29. Patrol units and narcotics investigators were called to take over the eradication process and the investigation. The plants ranged in height from about five inches to five feet. Sgt. 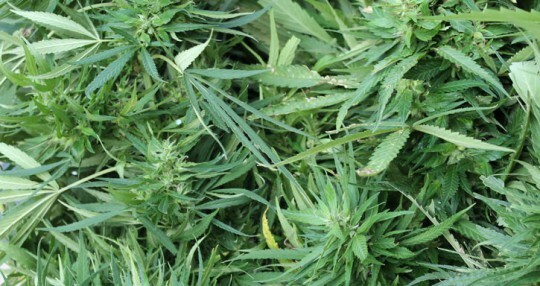 Robert Quinata, assistant officer in charge of the ECSO Narcotics Division, said the marijuana plants had a street value of about $80,000. No arrests had been made as of Thursday night as the investigation continued. The house at 7511 North Highway 29 is located down a long driveway, blocked from view from the highway by a large wooded area. 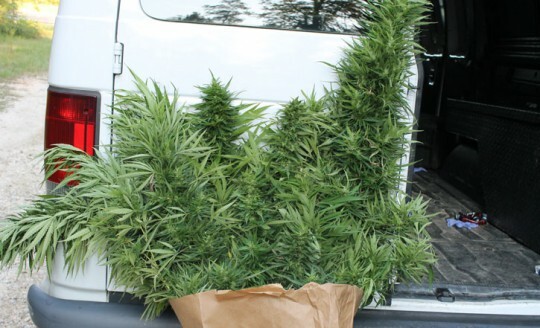 Deputies said the plants were growing in an open area behind the home, close to a shed. According to the Escambia County Property Appraiser, the property belongs to Keith and Donna Ciano, but deputies said they don’t know yet if the plants belonged to them. Pictured above and below: Marijuana plants found and removed from behind a home on Highway 29 in Molino Thursday. 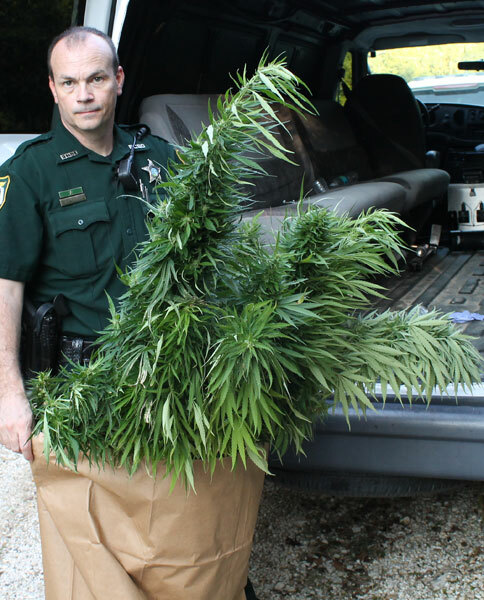 Pictured top inset: Deputy Mike Coburn with the marijuana plants. NorthEscambia.com photos, click to enlarge. Authorities are investigating threats made against Tate High School and an Escambia County school bus. According to deputies, a Tate student made the threats Wednesday against the school and the bus. The student was questioned Thursday at the school and found to have no weapons. They say he could face charges for making the threats. The exact nature of the threats has not been released. A Flomaton man was burned in a fire at a mobile home Thursday night. The 26-year old male reportedly suffered severe burns to his hands and face at his mobile home on Pecan Grove Lane just before 9 p.m. 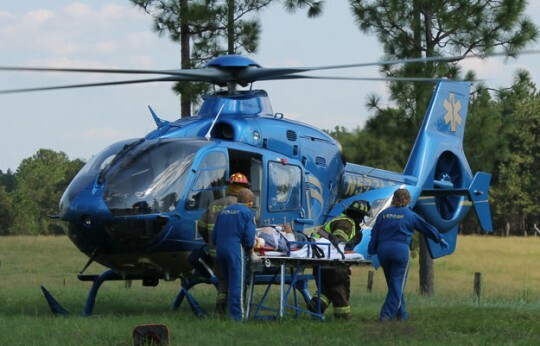 He was airlifted by LifeFlight to the University of South Alabama Regional Burn Center in Mobile. The fire was out as the fire firefighters arrived on scene. Further details were not available. It’s time for business owners and practicing professionals to renew business tax receipts. The deadline for renewing without a penalty is today, September 30, according to Escambia County Tax Collector Janet Holley. Applications and information for business tax receipts are available at www.escambiataxcollector.com. If you have any questions or would like to make an appointment, call the tax collector’s office at (850) 438‑6500, Ext. 252. Our weather will be perfect for your weekend plans — from high school football to the Jay Peanut Festival to anything outdoors. There is a red flag warning in effect for today — outdoor burning is discouraged. Today: Sunny, with a high near 85. North wind between 5 and 15 mph, with gusts as high as 20 mph. Tonight: Clear, with a low around 50. North wind between 5 and 10 mph. Saturday: Sunny, with a high near 75. North wind between 5 and 15 mph, with gusts as high as 20 mph. Saturday Night: Clear, with a low around 45. North wind around 5 mph. Sunday: Sunny, with a high near 75. North wind between 5 and 15 mph. Sunday Night: Mostly clear, with a low around 46. North wind around 5 mph. Monday: Sunny, with a high near 80. North wind between 5 and 10 mph. Monday Night: Mostly clear, with a low around 52. Northeast wind around 5 mph. Tuesday: Sunny, with a high near 83. East wind between 5 and 10 mph. Thursday: Isolated showers. Mostly sunny, with a high near 82. Chance of precipitation is 20%. Students of the Month for September have been named for Ernest Ward Middle School. They are (left to right) Kayleigh Linam, seventh grade; Sarah Dutton, eighth grade; and Celeste North, sixth grade. Submitted photo for NorthEscambia.com, click to enlarge. “Snoopy One” — one of three MetLife Blimps — was spotted over Atmore late Thursday afternoon. 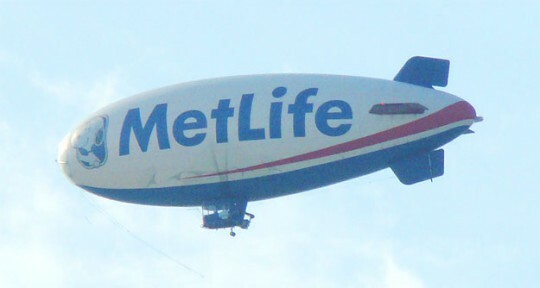 According to the company, none of the MetLife blimps requires the use of a home base. Together, “Snoopy One” and “Snoopy Two” combine to travel approximately 120,000 miles a year throughout the United States. Traveling with each MetLife blimp is a dedicated 14 member crew: two pilots and twelve crewmen. The ground crew includes electronic engineers, mechanics, licensed radio technicians, and riggers. In addition to these highly specialized personnel, each MetLife blimp operation requires five ground support vehicles; to move the blimp and crew from one location to the next. The primary focus of the blimp program is providing aerial coverage of sporting and special events. In a typical year, “Snoopy One” and “Snoopy Two” cover approximately 70 events for a variety of networks including NBC, CBS, ABC, ESPN and TGC. The blimps can be seen capturing shots of events ranging from the US Open and PGA Championship, to NFL football games across the country. Pictured above: “Snoopy One” as seen over Highway 21 in Atmore about 4:30 Thursday afternoon. Photo by Kim McCullough for NorthEscambia.com, click to enlarge. The Northview Lady Chiefs lost to Baldwin County High School in varsity and junior varsity volleyball Thursday in Bratt. Baldwin County defeated Northview 11-25, 15-25, 16-25. Misty Doran had three kills, a block and a dig for the Lady Chiefs, as Lily Townson added four assists. Morgan Payne posted three kills and one dig, and Paeton Hadley had one ace, two kills, an assist, one block and a dig for Northview (3-10, 3-3). Baldwin County defeated Northview 18-25, 14-25. Rebecca Grim posted two aces and three kills for the Lady Chiefs, while Danielle Steadham had four kills, three blogs and a dig. Junior Hannah Fiellin added two aces and one assist for Northview (7-6, 3-1). After a long battle with cancer, Mary Julia Cox White “Nano” went to be with her Lord and Savior, Jesus Christ on Wednesday, September 28, 2011, at the age of 68. She was born in Pensacola and resided in Century since 1975. Julia was employed by Century Pharmacy as office manager and gift manager for over 25 years. She enjoyed decorating, dancing, and spending time with her family, especially at Pensacola Beach. She attended Perdido Methodist Church in Perdido, AL. Julia was preceded in death by her mother and father, Evelyn and Clyatt Cox; her dear friend, Brother Lou Caballer; and sons-in-law, Charlie Booth and Jack Moran. She is survived by her two loving daughters, Lori Skaggs of Jay and Julie Booth-Moran of Century; one stepson, Russell White of Panama City; two sisters, Marlene Anthony of Century and Myra Reed of Cummins, GA. Nano was blessed with three grandchildren, Riley, Corey, and Danielle Skaggs; two great-grandchildren, Beverly and Logan Skaggs; adopted family members, Ivory Brown and his daughter, Ty McGee; many nieces and nephews; and her best girlfriend, Barbara Dorriety. Memorial service will be held at 2 p.m. Saturday, October 1, 2011, at Byrneville United Methodist Church in Century. Trahan Family Funeral Home is in charge of arrangements. She was loved by many and Nano to all. Three people — including a child — were injured in crash between a SUV and a piece of machinery Thursday afternoon on Highway 97 near Walnut Hill. Witnesses said 22-year old Brittany Tutton hit a loader after the equipment driver pulled into her path on Highway 97 south of West Highway 4 about 2:30 Thursday afternoon. The SUV overturned, coming to rest on its side on Highway 97. Tutton was seriously injured, while her passenger, a 3-year old Maddix, received minor injuries. Both were transported by ambulance to Baptist Hospital in Pensacola. Maddix was treated and released. The elderly driver of the piece of equipment, Sam Tichi of Walnut Hill, was seriously injured and transported to Baptist Hospital by LifeFlight. The crash remains under investigation by the Florida Highway Patrol. Further details have not yet been released. 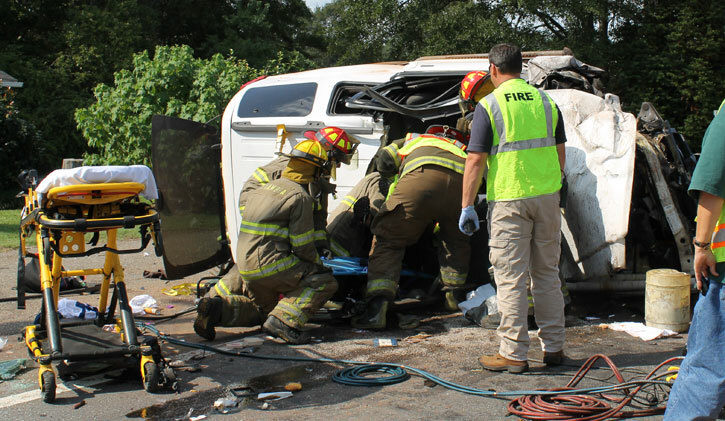 The Walnut Hill, Century and McDavid stations of Escambia Fire Rescue, the Atmore Fire Department, Atmore Ambulance and the Escambia County Sheriff’s Office also responded to the crash. For a photo gallery from the scene, click here. Pictured above: Firefighters used the Jaws of Life to free a 22-year woman from this SUV after she collided with a piece of equipment (pictured below) crossing Highway 97. The occupant of the equipment was transported to Baptist Hospital by LifeFlight (inset). NorthEscambia.com photos, click to enlarge.